What better way to spend an afternoon in the woods than making dens. If you were surviving in the wilds, shelter would be at the top of your list of things to find – or make. But we aren’t trying to survive, we are just having fun. Maybe, fending off hordes of attacking savages or just making a forest home. Either way, making a woodland den is a good couple of hours of fun, work, exercise and is something that will probably last a few years. We know of quite a few good dens that have lasted a considerable time, given they were made from sticks and bailing twine. They have often been very shabby when we have returned, and some have new inhabitants like mice and shrews, but many have acquired new contributors who have added extensions and even fixed up the roof. 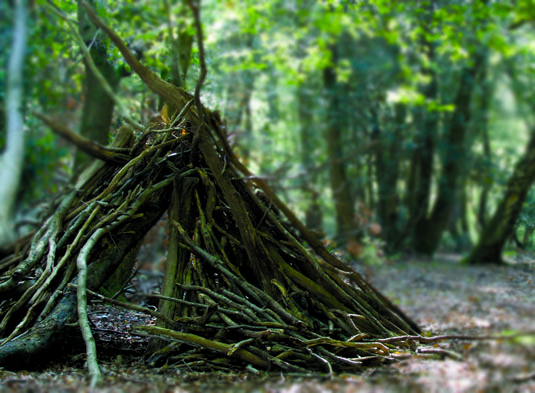 So a good den can not only be a home for local wildlife, but a base for adventures. Make the base frame using large branches. Preferably ones with a “Y” at the top. Link the branches together and lash securely with Paracord. Leave a small section open for the door and add branches all round the outside. Once you have the main frame, fill in with leaved branches and bracken. You can fill in any gaps with more leaves or pine needles.